Stop putting off your dreams – your life’s mission– because you don’t feel you have enough time. Become the most productive person you know. As Dale Carnegie said, “An hour of planning can save you 10 hours of doing.” It may seem counterintuitive to spend time planning, when time feels scarce already. However, the time you spend planning will allow you to accomplish your work more efficiently and make your dreams a reality. 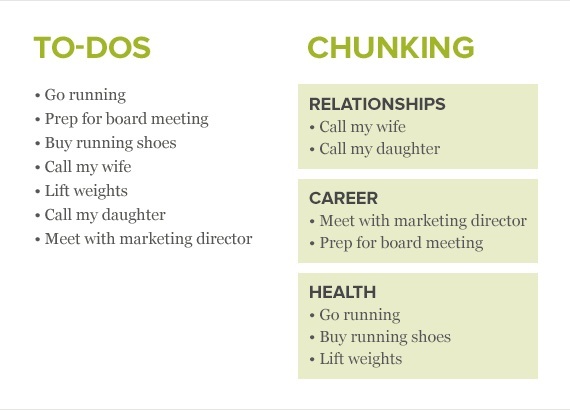 In order to maximize productivity “chunk” your to do list. Take your various action items and group them together, orienting them toward a common outcome and result. Simply put, chunking is the process of turning more into less! Set aside an hour at the beginning of every week to just think and plan out your week. Write down what you accomplished in the previous week that you’re proud of. Write down what you were unable to accomplish. Prioritize what needs to be done this week. Find ways to be more efficient. Put away all your distractions and truly focus on how you can make your upcoming week more manageable. As soon as you complete a key task or objective, reward yourself!